One of the strangest events in maritime history relates to Massachusetts. The crew and passengers of the Mary Celeste, a brig of 236 tons, vanished from the ship without a trace, creating a mystery that remains unsolved today. When the ship was discovered abandoned, it was undamaged and the Captain's log intact, with even personal items such as tobacco pipes undisturbed from their normal places. What made this event shocking was that the Captain had a good reputation as a seaman, and his wife and child were also aboard the ship. 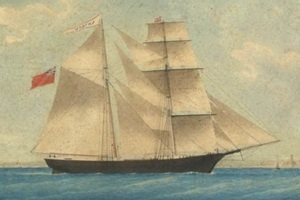 Mary Celeste was partially insured by a Boston company, and the ship's captain was from Massachusetts. The vessel was also later refitted at Boston after the mysterious disappearance of the crew. The major theories of what happened to the people are: (1) piracy, (2) mutiny, (3) abandonment of the ship due to a false belief that it was sinking, and (4) mass murder and suicide. Insurance fraud was unlikely because the valuable cargo remained intact. Two other notable facts about the Mary Celeste are that the ship was later scuttled deliberately in a failed attempt to collect insurance proceeds, and that Sir Arthur Conan Doyle wrote a fictional account of the Mary Celeste event in 1884 that made the mystery infamous in maritime history. The February 24, 1873 Boston Post describes the Mary Celeste mystery: "It is now believed that the fine brig Mary Celeste, of about 236 tons, commanded by Capt. Benjamin Briggs, of Marion, Mass., was seized by pirates in the latter part of November, and that, after murdering the Captain, his wife, child, and officers, the vessel was abandoned near the Western Islands, where the miscreants are supposed to have landed. The brig left New York on the 17th of November  for Genoa, with a cargo of alcohol, and is said to have had a crew consisting mostly of foreigners. The theory now is that some of the men probably obtained access to the cargo, and were thus stimulated to the desperate deed. The Mary Celeste was [retrieved] by the British brig Dei Gratia, Capt. Morehouse, who left New York about the middle on November. The hull of the Celeste was found in good condition, and safely towed into Gibraltar, where she has since remained..... The Vice Admiralty court sat yesterday, and will sit again to-morrow. The cargo of the brig has been claimed, and to-morrow the vessel will be claimed. The general opinion is that there has been foul play on board, as sports of blood on the blade of a sword, in the cabin, and on the rails, with a sharp cut on the wood, indicate force or violence having been used, but how or by whom is the question. Soon after the vessel was picked up, it was considered possible that a collision might have taken place. Had this been the case, and the brig’s officers and crew saved, they would have been lauded long ere this. We trust that if any of New England’s shipmasters can give any information or hint of strange boats or seamen landing at any of the islands during the past ninety days, that they will see the importance thereof." "You are requested to furnish this Department with any information you may be able to obtain, affording a clue which may lead to a discovery of all the facts concerning the desertion of a vessel found on the 13th of December last, in latitude 280 20’ north, and longitude 170 51' West, derelict at sea, and which was towed into the harbor of Gibraltar by the British vessel Dei Gratia, and there libeled by the savors. From the log of the abandoned vessel she is supposed to be the American brigantine Mary Celeste, bound from New-York to Genoa, and it is supposed that she hailed from New-York, and that her master’s name was Briggs. The circumstances of the case tend to arouse grave suspicions that the master, his wife and child, and perhaps the chief mate, were murdered in the fury of drunkenness by the crew, who had evidently obtained access to the alcohol with which the vessel was in part laden. It is thought that the vessel was abandoned by the crew between the 25th day of November and the 5th day of December, and that they either perished at sea, or, more likely, escaped on some vessel bound for some North or South American port or the West India Islands. When discovered the derelict vessel was thoroughly sound, with the exception of the bows, which had been impaired by some sharp instrument. She was well found and provisioned, and no reason for her desertion was apparent. A sword, with the appearance of blood thereon, was on board, and marks of blood were found upon the sails. The vessel’s documents and chronometer have not been found, but almost the whole of the personal effects of the master and his wife and child, and of the crew, were discovered in a good condition, and books, trinkets, gold lockers, and female wearing apparel of superior quality, were left untouched in the cabin. The log was complete to Doom of the 24th of November. Many other details concerning the matter are in possession of the Department, and will be furnished on application if necessary." Mary Celeste created an international incident. The June 27, 1873 Timaru Herald (New Zealand) ponders the open questions: "Where was the captain? What had become of the crew? The brigantine was sound above and below, and had apparently encountered no bad weather. No injury had been sustained by the furniture and stores; the seamen’s chests and clothing were in their places and clothing were in their places and perfectly dry, the razors even being free from rust; a small bottle of oil used for a sewing machine was found in a perpendicular position, with a thimble and reel of cotton near it; an harmonium was in the cabin, the music and other books untouched: and last of all, the effects found were of considerable value, and proved that a lady and child had been on board." We will probably never know what happened to the people aboard the Mary Celeste.